A video has been leaked on YouTube, allegedly showing how trophies will unlock on the PS4. 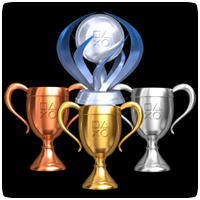 The 22 second video shows the new trophy notification position and animation, but the sound effect remains the same. The trophy name in the notification also stands out a lot more. The notification is also more in line with the look and feel of the PS4’s dynamic menu, using sharp corners and a black background, instead of the grey rounded notification seen on the PS3. It worth noting that this video hasn’t been verified and may not be what the final notification will look like on the launch console.